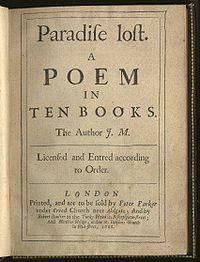 Paradise Lost is an epic poem by the 17th-century English poet John Milton. It was originally published in 1667 in ten books, with a total of over ten thousand individual lines of verse. A second edition followed in 1674, re-divided into twelve books. The poem concerns the Christian story of the Fall of Man: the temptation of Adam and Eve by the fallen angel Satan and their expulsion from the Garden of Eden. Milton's purpose, stated in Book I, is to "justify the ways of God to men" and elucidate the conflict between God's eternal foresight and man's free will.